Writer in the Pines: Saturday Sample - A Recipe! Saturday Sample - A Recipe! Way back in 1985 when I edited a newsletter for writers, I solicited recipes from my contributors for a short cookbook pamphlet. I ended up with thirty-one quick and easy recipes, and touted it as "One new thing to eat a day for a month." Yeah, that's awkwardly put. The idea was that a writer could have something on the table for dinner even after writing all day long. 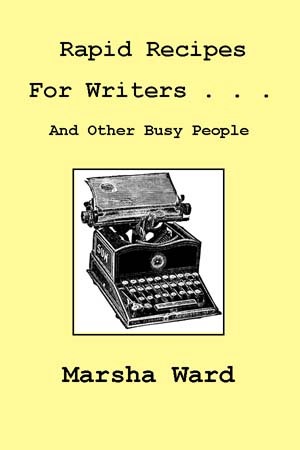 I called the booklet Rapid Recipes for Writers...and Other Busy People. I didn't vet the recipes for calorie content, break down the nutritional elements, or otherwise make claims for wholesome goodness. They were simply tasty, quick recipes. A couple of days ago I wanted to cook up the package of chicken thighs that had been sitting in my fridge nearly too long, so I tried to remember one of the recipes that I had collected during the two years I lived in South America. There's nothing Hispanic about the recipe. It came from an Anglo. However, it was a very tasty chicken recipe that I have made numerous times for my husband and children. I didn't take the time to pull out the recipe from the cookbook, which I revamped and published as a free electronic book back in 2010. I just improvised, changing a key ingredient to a similar one. The chicken turned out to be delicious, and the rice even more so. As a special treat, my Sample this Saturday is the original recipe--which I can't even make anymore, due to my severe mushroom allergy. I used cream of chicken soup in my chicken cook-up this week, and it worked just as brilliantly. Place in bottom of 9x13-inch pan. Sprinkle 2/3 of a package of onion soup mix over mixture. Lay one cut-up chicken over soup mixture, skin side down. Sprinkle remaining soup mix over chicken. Cover with foil. Bake at 350 degrees F. for 2 hours**, while you go to Sunday School or on a shopping trip, or finish another chapter of your novel! Rapid Recipes for Writers...And Other Busy People is available FREE at Amazon, Smashwords, and other retailers of ebooks. * The original name of this recipe is "Relief Society Chicken," after the name of the ladies auxiliary in The Church of Jesus Christ of Latter-day Saints. Once upon a time, the Relief Society held "work meetings" on a weekday, where the women would gather to quilt, make crafts, or otherwise learn home skills. I changed the name for the cookbook, in an attempt to make it a bit more universal, at least to Christians and those familiar with the Sunday School concept. ** If I need a three-hour stretch of time for the recipe to bake, I turn the temperature down to 300 degrees F.